Bathtub and shower tile and grout can get notoriously dirty. Then again, dirty isn't even the right word, since mere dirt is preferable to the slimy, moldy debris or the bulletproof soap scum that accumulates on tile if it goes too long between cleanings. If you have ever power washed your driveway or walkway, you may have looked over at the house and wondered whether you can transfer operations indoors to the bathroom: Is it possible to use the same massive water power that you use to blast away moss, dirt, and oil from the driveway on indoor bathroom wall tile? The answer is yes. 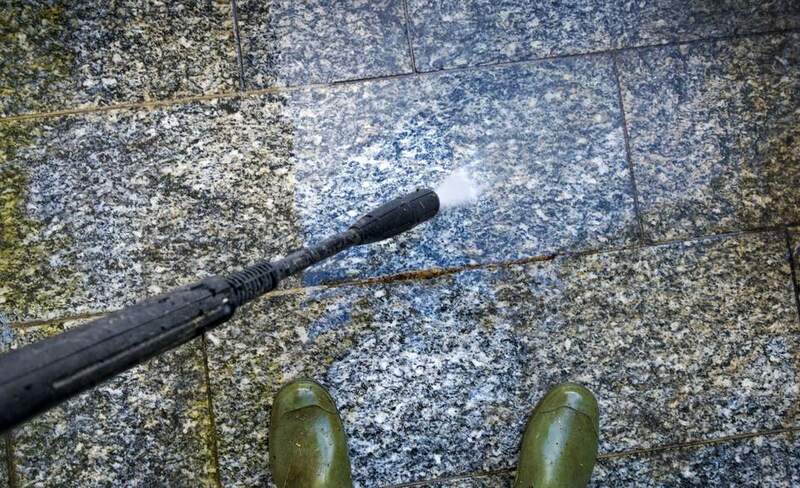 You can harness your pressure washer's intense water jet and apply it to indoor tile, and it can clean better than steam cleaning. But the trick to preventing a mess—and potential tile damage—is to do it right. While cleaning bath or shower tile with a pressure washer is quick and effective, if you are envisioning a total replacement for traditional hand-scrubbing, one that you can do on a weekly basis, your fantasies will fall short of reality. Power washing your indoor wall tile should be an infrequent activity. Depending on the health of your tile grout, the grout may or may not suffer. Also, setting up and taking down the cleaning operations can be burdensome. Most importantly, do not spray any areas where there are gaps in the grout or caulk joints. Pressurized water can easily force its way into tiny crevices and get to the wall materials behind the tile. Use this method only if all of your tile, grout, and caulk joints are perfectly intact. If you have moisture-intolerant flooring, such as engineered wood, solid hardwood, or laminate, you may not want to do this project because the floor might get wet. Also note that this is suitable for indoor wall tile, not floor tile. Finally, be cautious with refinished, or re-glazed, tile and tubs, as the finish paint may chip away. Power washing your indoor tile is heavy on setup and tear-down procedures. Overspray is an inevitable byproduct, but you can take precautions against this. Plastic sheeting on the floor and ceiling can help keep the space drier, but it will never remain completely dry. In this regard, it helps to have bathroom flooring that holds up well against moisture: ceramic or porcelain tile, natural stone, vinyl plank, or sheet vinyl. One way to limit overspray is to run a wall of plastic sheeting in front of the tub or shower, holding it to the ceiling with Zipwall poles or tape. Tuck the bottom of the plastic into the tub, so that water will drain back into the tub. You can also lay plastic sheeting on the floor and extend it 12 inches up the wall to protect the lower section of the walls and prevent water from getting under the baseboards. It's also a good idea to have plenty of large beach or bath towels nearby to mop up water. Place the power washer outdoors, as close as possible to a bathroom window that gives you access to the bath or shower. Connect a garden hose to the pressure washer. Feed the pressure washer hose and nozzle through the window and into the bathroom. Plug in the pressure washer to the nearest GFCI outlet. Warning: Never run a gas-powered pressure washer indoors. Gas engines emit deadly carbon monoxide gas and must be fully ventilated at all times when running. Attach a fan tip to the pressure washer spray nozzle. Do not use a pinpoint tip, which can easily damage the grout. Set the spray pressure at a low setting. If necessary, you can inch up the pressure if the initial setting is too low, but use only as much pressure as needed to clean the tile. Begin by spraying at the top of the tile, working in horizontal runs. After you finish a complete run, move down about 6 inches and do another run. By starting at the top, you ensure that debris keeps moving downward, away from cleaned areas. To minimize overspray, keep the spray at a 45-degree angle and always point down or sideways. You want as much water as possible to drain back into the tub and down the drain. The bottom edge of tile, where the tile meets the tub or shower floor, is filled sealed with caulk rather than grout (at least it should be). As you work your way down to this caulk joint, stop spraying a few inches above the caulk to prevent damaging it. Turn off the pressure washer, and feed the hose back outside. Clean the tub or shower with a sponge to remove the debris and residue that collected on the tub deck, soap dishes, and other horizontal surfaces, due to the pressure washing. Dry the bathroom floor with a mop or clean rags, as needed.